Branded Cards. Virtual Cards. Get the custom reward Visa & Mastercard that’s right for your incentive program. 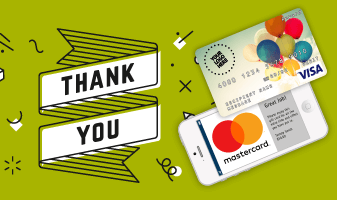 Our Visa, Mastercard or gift cards are an easy way to show your appreciation to the people who are important to your business, both customers and employees alike. Your rewards are chosen by you and customized to your brand. Find out how you can start giving today. Happy Cards combine many great brands into one perfect gift for anyone and any occasion. Choose from a variety of themed options. One gift card. Many brands. More freedom.